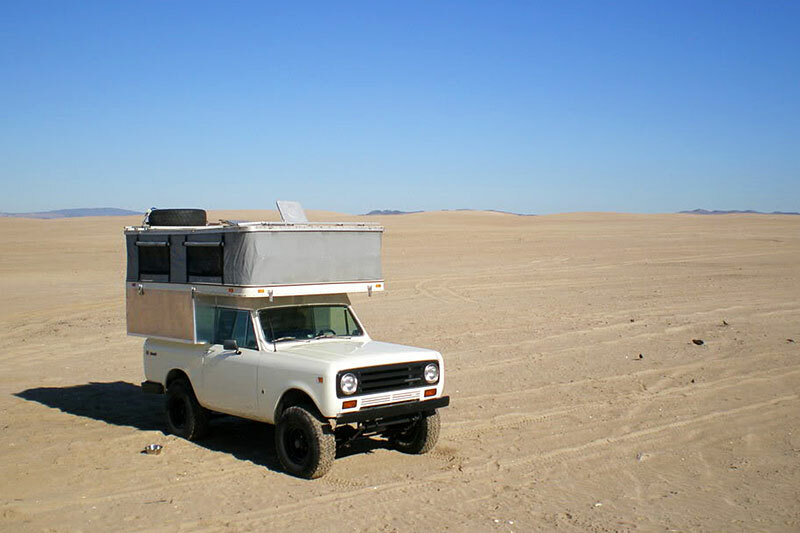 As an avid camper and off-roader, my desire for the perfect camp setup started in high school. 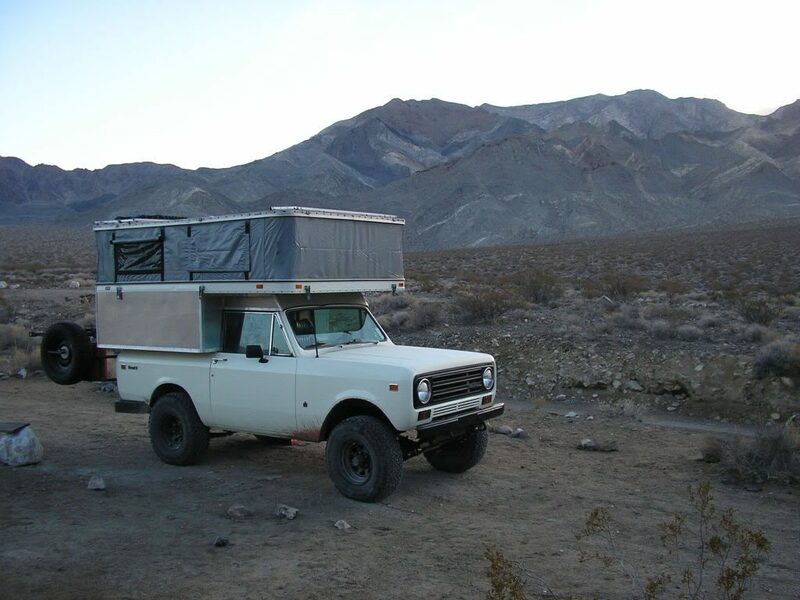 A Scout 80 was the vehicle of choice (and budget), and it was my gateway into off-road travel and backcountry camping in the Sierras. Due to budget constraints, that vehicle was replaced with something more reliable during those college years. Although I camped often for the next decade in tents, a Subaru wagon, and a camper shell, I didn’t re-enter the 4×4 world until the early 2000’s with a Ford Ranger. My wife and I camped 15 – 20 times/ year, and the packing, setup, and breakdown consumed the majority of my time. Time that was supposed to be spent enjoying the outdoors. In 2006, I purchased a 1972 Scout. We picked up a small tent trailer for $150, used it on our honeymoon, and realized that it was not the ideal setup. Standing up was a game changer though, and I sought to incorporate that aspect into the vehicle. I found a used Fourwheel Camper, designed for a Chevy Blazer, and painstakingly fit it on the Scout. Not before stripping it down to the frame, insulating it, installing new aluminum sheet siding, and rebuilding the interior. In my book, it was a work of art. A forced air furnace, running water, and a comfy bed made it a great little cabin on wheels. And most importantly: room to stand up. That setup was relatively reliable, but long freeway hauls and the 4-speed transmission were not it’s strength. With the addition of our first child, and another on the way, we decided to let it go in 2011. Enter the Toyota Tacoma. A reliable and capable 4×4, with a manual transmission and factory-locker, that could safely transport the family into the backcountry. It was, and still is, my dream vehicle. But I wanted to stand up… I first saw the Flippac in a tiny ad, in the back of a 1992 Peterson’s 4wd magazine, and Dave Bennett’s Expedition Portal build thread sealed the deal. We purchased a Flippac in 2012 and the interior build started before I picked it up. It was an excellent setup for many adventures with and without the family. Inclement weather camping got the best of us, and Iggy and I started talking about building custom campers in 2015. This project was put on hold by a purchase of a Fourwheel camper. I was so excited to be back in a hard-roofed camper. It was very tight for a family of 4, only lifted to 6’-1” (I’m 6’-2”), heavy for our purposes, and the off-road clearance was a challenge in the trees. 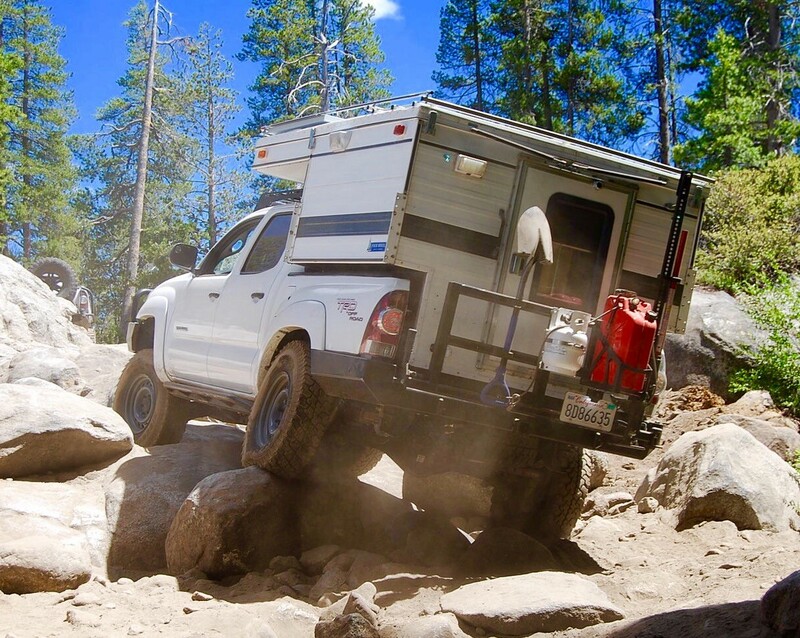 I did manage to drag it through the Slickrock trail, twice, and multi-day off-road trips through the Sierras and Death Valley. 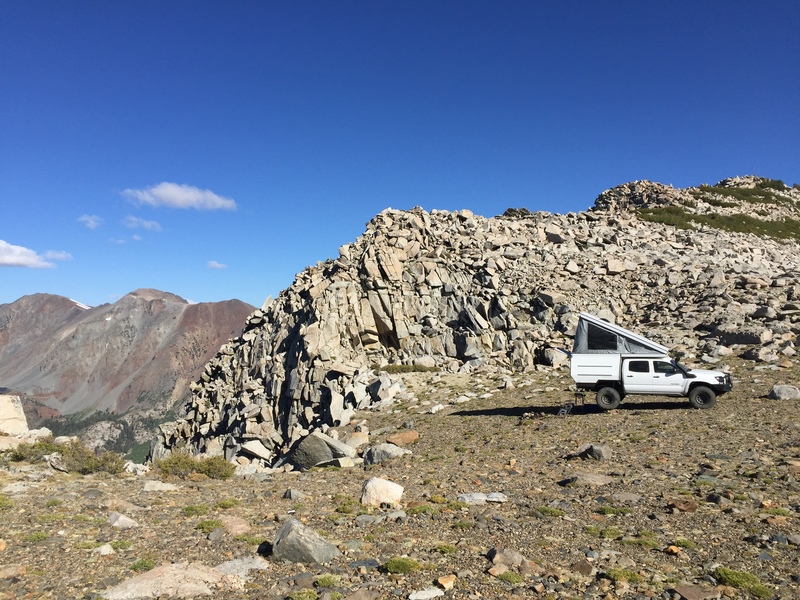 The custom camper project was revisited in November of 2016, and we fully committed to its success. I chose a flatbed camper for the space. The wedge was picked for many reasons: ease of setup, interior height, stability in the wind, and inclement weather resistance. That camper was “the one”. The culmination. Or so I thought… We decided to share our creation with the off-road and overland communities by forming Vagabond Outdoors. My dream camper was sold to help start the business and allow me to represent the product we manufacture. I have no regrets selling my dream setup, in exchange for the dream of starting a business building pop-up campers. 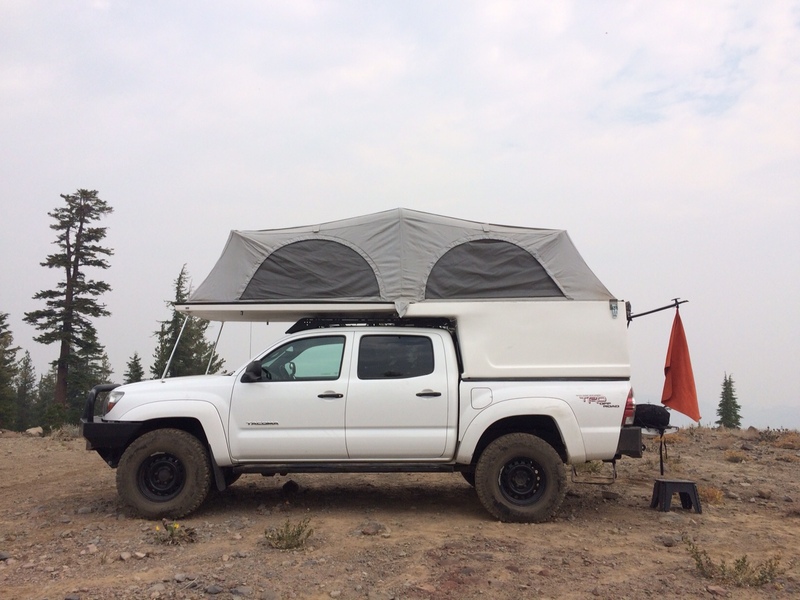 With Iggy’s ingenuity and business & manufacturing expertise, coupled with my obsession and experience with pop-up campers, we knew that our product would include the benefits of every setup and include our homegrown improvements. Then we decided to make it stronger that anything we could throw at it. As co-founder of Vagabond Outdoors, bringing the Drifter to market and sharing my pop-up camper experiences couldn’t be more exciting. We’ve gone over every detail and were able to refine each aspect of the camper over the last year and a half. It’s been a long time in the making, and that time has finally arrived.